When I was in my early 20s, I had occasion to live in Europe for almost two years. More specifically, I lived in France. During my time there I lived in several different locations, but the majority of that time I spent in Paris or its suburbs. During one period I worked in Paris six days a week. Monday afternoon’s terrible news from Paris sent shockwaves through many corners of the world. It sent one through my heart. 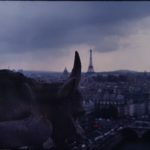 With that in mind, here are some personal reflections on the incredible place known as Notre Dame de Paris. The Cathedral of Notre Dame sits on the Ile de la Cité, the island birthplace of Paris. Ile de la Cité was also my introduction to the city. The first time I traveled with friends from my home some 15 or so miles south of Paris into town, we came up from the subterranean RER/Metro system at the entrance to the island’s Metro station. Suddenly, there it was, all of that storied history as I looked in every direction. On that March day I actually went both in and beneath Notre Dame. I say “beneath,” because unknown to many, an entrance exists on the plaza (parvis) in front of the church that leads down to the level of the old Gallo-Roman city of Lutetia. Called the “Crypte Archéologique,” it allows visitors to immerse themselves in 2,000 year old ruins. Great stuff. It was Bastille Day, the French national holiday, and we ventured into Notre Dame as we were killing time before heading to a bridge on the Seine to watch the evening’s massive fireworks display. When we walked in, I heard a choir singing – in English, which surprised me. A choir composed of American high school students was performing in the cathedral, and I still have a recording of their rendition of “Battle Hymn of the Republic.” The students stood drenched in colored reflective light from stained glass windows, the sounds reverberating around me and then sinking into the structure’s deep recesses. 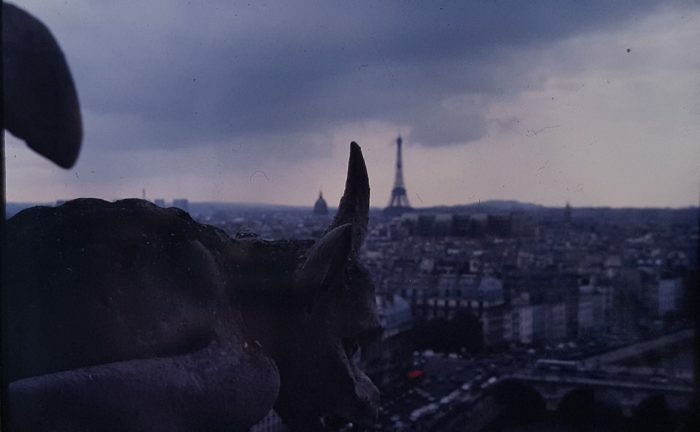 Later that year, I took the plunge and made my pilgrimage to the top of Notre Dame. I will preface this by saying that I am intensely claustrophobic, and the thought of going up stone-lined, twisting, relatively narrow (in one place basically one person wide) tower staircases terrified me. I told myself, however, that nothing would keep me from experiencing something so unique. I took a deep breath and climbed the 400 or so steps. As if to add to the fright, there had just been a small thunderstorm over Paris. For those who have been, you will know that part way up the ascent of the North Tower, a tall vaulted ceilinged stone chamber appears. To one side are a set of spiral steps leading to “Esmerelda’s Cell,” and includes a quote from Hugo’s The Hunchback of Notre Dame. One then resumes the climb, finally reaching the open gallery on the front of the cathedral. The rain had just ended. The skies were still replete with dark clouds, but footing seemed secure. Today wire meshing that protects visitors as they cross from the North to South Tower, but that meshing does not exist in my memory. Once there, one is literally among the gargoyles and chimera; fantastic birds, grotesque monsters, and beasts abound. 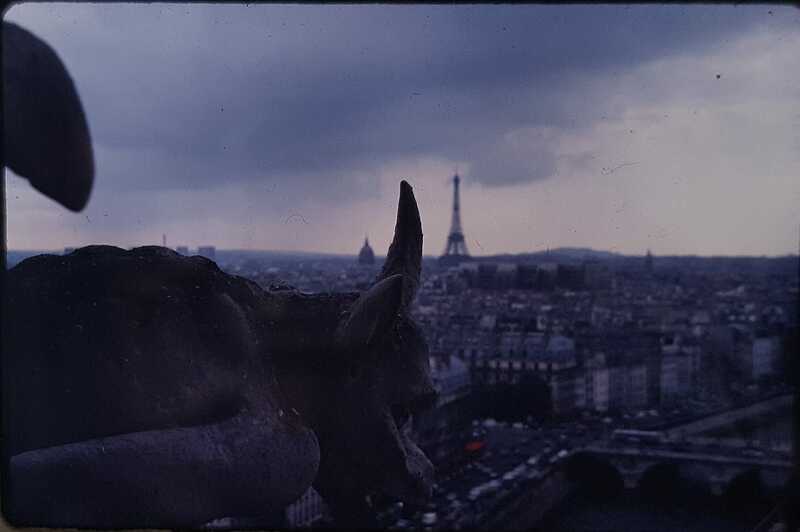 I remember looking out across Paris. As one is looking west, Les Invalides and the Eiffel Tower were very visible. I took a handful photos with my newly acquired Zenit camera (from Russia). One of those images is above and to the right (click the thumbnail for a fullscreen version). I would have other encounters with Notre Dame to catch a bit of a mass and hear the magnificent Cavaillé-Coll organ, a must as a church musician. I have not been back to Paris, but it continuously beckons. Fortunately, as Ernest Hemingway once penned, “If you are lucky enough to have lived in Paris as a young man, then wherever you go for the rest of your life, it stays with, for Paris is a moveable feast.” Truer words were never written. Elle me manque toujours, la Ville de Paris. May God bless you, Paris, even in the midst of tragedy. Que Dieu vous benisse.